Why isn't this against the law? Home is where the tent is, for dozens of displaced residents camping out on South Main Street in South Bend. “It was the tent right here behind me, guy took a knife and slit the door open on it because the guy wouldn’t’ answer the door,” said Edward Granzo, one of about 40 people living at the tent city under the bridge just south of the TRANSPO station. The guy who slit the tent door was eventually arrested by police for intimidation—but never charged. Today, the symbolism was hard to miss. A total of 25 tents were set up along the sidewalks on the east and west sides of S. Main Street. As for getting help in the short run, the number one, and number two priorities are exactly the same. “We need a bathroom, like a potty john, a couple of them, one for the ladies and one for the men,” said Terry Bolden. The nearest restroom is now located at the TRANSPO bus station, but tent city residents say use of those facilities is now being restricted to those holding bus tickets. “A lot of people, I don’t know, they find some privacy somewhere it’s ridiculous,” said Granzo, gazing off at the great outdoors. Still, South Bend Mayor Pete Buttigieg dismissed the idea of bringing in portable toilets. “I think it’s probably a move in the wrong direction to do anything that encourages that, encourages them to be outdoors in the public right of way. The pressing problem now is to find an acceptable solution before the arrival of threatening temperatures. WNDU- why did you title the article, "Tent Protest...?" What are they protesting? I only see that it is a tent city that believes and expects society to take care of them, when they are not willing to seek out the resources that will establish the three basic needs for survival (e.g. food, clothing, and housing). They choose instead to urinate and defecate in public areas and expect the city to place a port a potty near them? Clearly a sense of entitlement is occurring. The Mayor is dancing around the cause. If their were means for them, they would not be in a tent! Come on now. Sounds to me that you just want them out of sight, out of mind? I agree. They need assistance but that also comes with the price of getting alcohol and drug abuse help. The Center for the Homeless is a great program but you cant pick and choose the help or rules that you want to follow while being homeless and in need. Also, they have been there way more than a month. People started gathering there when the road construction started months ago. It wasn't until some kind man started buying tents for them that it became a tent Village. The people were sleeping directly on the pavement before that. Also these are not new residents... they've been on the streets of SB for a while ... it's just now they have "shelter". Many of them suffer from mental illness, alcoholism or drug addiction. Years ago when I worked a downtown walking beat and rode a bicycle on patrol along the eastrace, I would regularly come into contact with numerous people who were homeless setting up wherever they could. Most all of them were not even from Indiana. That's right! They were not even residents of the state much less the city of South bend. In speaking with them over the years, many of them told stories of being from neighboring states and some as far away as New Mexico relocating to South Bend having been told of the Center for the Homeless and Notre Dame. All believed if they just could make it here, they would be housed and fed. Unfortunately, most all were chronic alcoholics and drug abusers. They would resort to breaking into businesses, cars and steal just about anything they could get their hands not to eat, but to get stoned and drunk. THAT is exactly what is going on under the bridge. so all these so activists and the mario's and Jesse's of the world who are trying to make everyone believe their doing God's work and simply enabling a group of people who don't want to help themselves in most cases. Are there truly some who need the help? Yes of course. Especially those with small children and nowhere to go. I'm all for giving my own money for them. But these other opportunist down there who would rather get high and drunk and crap in the parking lot, I got nothing for. saywatanayo wrote: Years ago when I worked a downtown walking beat and rode a bicycle on patrol along the eastrace, I would regularly come into contact with numerous people who were homeless setting up wherever they could. Most all of them were not even from Indiana. That's right! They were not even residents of the state much less the city of South bend. In speaking with them over the years, many of them told stories of being from neighboring states and some as far away as New Mexico relocating to South Bend having been told of the Center for the Homeless and Notre Dame. All believed if they just could make it here, they would be housed and fed. Unfortunately, most all were chronic alcoholics and drug abusers. They would resort to breaking into businesses, cars and steal just about anything they could get their hands not to eat, but to get stoned and drunk. THAT is exactly what is going on under the bridge. so all these so activists and the mario's and Jesse's of the world who are trying to make everyone believe their doing God's work and simply enabling a group of people who don't want to help themselves in most cases. Are there truly some who need the help? Yes of course. Especially those with small children and nowhere to go. I'm all for giving my own money for them. But these other opportunist down there who would rather get high and drunk and crap in the parking lot, I got nothing for. There was a request by the group of do-gooders to stop helping. 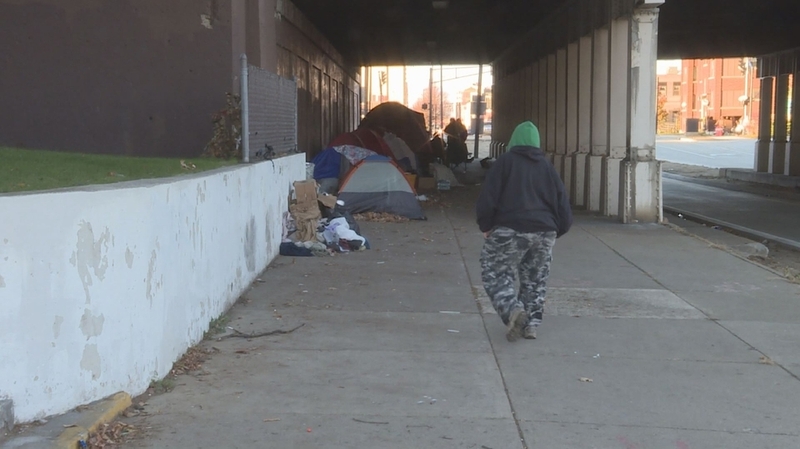 Financial adviser Leo Priemer, whose downtown South Bend office is a block away from a tent city for the homeless that’s developed under the Main Street viaduct, said he already locks his doors during regular business hours. A couple weeks ago, in the middle of the night, someone shattered his front door window. There’s a bullet hole in another window. Those people living in the tents, many of whom are ineligible for the array of homeless programs in that part of the downtown because of their behavior or drug and alcohol abuse, could soon move much closer to Priemer. The city plans to give Hope Rescue Mission $125,000 to buy the former Kraz building on Monroe Street, next door to Priemer’s office, to shelter people living in the tents this winter. The city’s Board of Public Works has approved the expenditure, to come from Economic Development Income Tax money, which still must still pass the city’s legal review. If that happens, Priemer said, he will consider moving out of the location he has operated for 25 years. Fred Ferlic, a retired surgeon and former city Common Council member, said Priemer isn’t alone. He said a handful of other nearby businesses also oppose the Kraz building plan because they believe it will result in a permanent expansion of the homeless services infrastructure in that area. That would reverse progress the city has made in revitalizing the downtown, Ferlic said. But Mayor Pete Buttigieg stressed Friday that the city wants to have a more permanent solution in place by next winter, such as a plan to convert the former Olive School in the Rum Village neighborhood to housing units that would serve such individuals. As soon as the Kraz space is ready, the city will force the tent city to disband, Buttigieg said. While Priemer would welcome elimination of the tent city, he said, he was skeptical that Hope will stop using the Kraz space after this winter. “Will they put that in writing?” Priemer said. Ferlic said the businesses are frustrated in their perception that the city administration has largely ignored their concerns about the tent city — where people are openly using drugs and relieving themselves in public — and hasn’t sought their input regarding the Kraz building plan, so they asked Ferlic to intervene because of his former role on the council. Buttigieg objected to that characterization. Other businesses that Ferlic said oppose the Kraz building plan declined to be identified by The Tribune when contacted by a reporter because they fear negative public reaction. Ferlic said the businesses are planning a meeting Nov. 16 to discuss possible solutions. Buttigieg said whomever takes on the problem of how to serve the “chronically unsheltered,” whether it’s the existing Continuum of Care or a new group, will likely need input from a wide range of people, including the business community. Nothing says it better for downtown development than having three separate and distinct homeless shelters in the DTSB. Great Job Mayor Pete. There are many churches and places to go for shelter. Yes, many churches. Eighteen Catholic churches in SJC the last time I counted. However, churches got out of the "widows and orphans" business about the same time they withdrew from helping the dispossessed such as these. Notice that the discussion here centers around government solution(s). Importantly, the government did not assume this ministration by force, but rather churches disengaged the "heavy lifting" of our culture, and our government took over that turf by default. The "huddled masses", previously wards of the community of faith, are now wards of the state. SOUTH BEND — There's a countdown for the owners of a red tent in downtown South Bend to find a new home. The wooded area off East Tutt Street has been home to dozens of homeless people at one time, but now campers say they've been told to go. “It’s a vicious cycle,” community activist Jesse Davis says. Sunday morning he shot an online livestream showing residents packing up to go. The camp is on private property that is loosely bordered by the railroad tracks, South Michigan and East Tutt. The South Bend code enforcement department says the property owner is working to evict the homeless from the property. “It's not a solution, it's kind of like kicking the can down the road because these folks are still going to be homeless,” Davis says. “If they pick their tents and belongings up tonight and they move they're going to move somewhere else." It's unclear what started the push to go. Some say there was a dispute over how campers were clearing out trash. But police say if the private property owners there want to pursue a trespassing case, they are within their rights to do so. Davis says many residents relocated to the camp after the Main Street Bridge encampment was torn down last year. The encampment is just steps from Center for the Homeless. Many of the camp residents say, they'll choose to move somewhere else on the street. Most of them have already relocated. “Unfortunately by moving them out of here, they’re just going to move somewhere else, so it’s doing nothing to solve the problem,” Davis says. Homeless people are back at their encampment under the Main Street railroad bridge. South Bend is looking at new ways to deal with the recurring problem. WSBT 22 had South Bend Mayor Pete Buttigieg on set Tuesday morning to discuss the issue.